Hope your week's going dandy. I've spent most of mine re-watching the entire series of The Office for the tenth time (all while working from home, of course), so I'd say it's been half a week well spent. Today I'm wearing this very lovely quilt coat from Impressions Boutique that's been keeping me warm these past weeks! It's the perfect length, which is nice because the longer the coat, the more of your body it keeps warm (which I'm all about). With colder days ahead of us, it's important to stock your wardrobe with a variety of cute coats to wear! When I first moved to Utah, I had ONE winter coat and it was embarrassing because since I wore it every day, it looked like I wore the same outfit all season long in pictures. Yep. I was an outfit repeater. So make sure you have a choice of coats to wear this winter, especially this quilt coat because it's theee bestttttt (said in a Nacho Libre accent). If it wasn't so creepy, I'd write a love letter to these babies. Hands down, the COMFIEST boots I've ever worn in my ENTIRE life. It's like walking on clouds, guys. I feel like I could run a marathon in them and my feet still wouldn't be sore after (but the rest of my body would collapse). They're faux-fur lined, have a padded footbed, and the heel has a durable rubber outsole so you don't need to worry about slipping in the winter. I really can't stop saying nice things about these boots because they're freakin' perfect! Anyway, back to binge watching The Office. Just watched this episode and this part cracks me up every time. when i moved to utah, all i had was a gray peacoat! and i died laughing when i read your post because i thought i looked like i was wearing the same outfit every day too! plus it was dark gray and most of the times i wore black jeans, so there was great contrast between the coat and the jeans....haha but not really. maybe i was just mourning my loss of the california sun. love the criss-cross sweater too!! Cute look, Ariel! 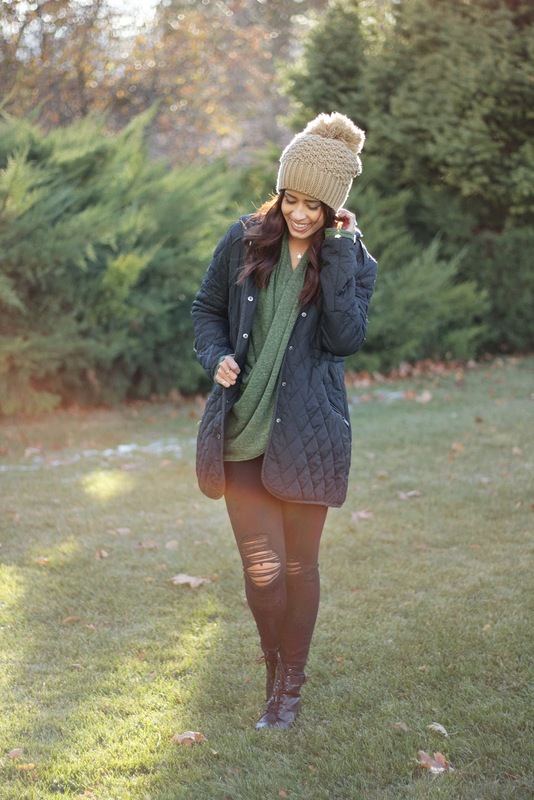 I love the pom-pom beanie and quilted coat combo! This look is soo perfect! I love everything about it! I'd definitely be writing love letters to that whole outfit! So cute!